Chris Proctor, MD, a California-based practitioner with experience in use of PRP, PRC and related products (Proctor is a PSC stockholder), conducted a study on the capture of platelets through the use of the Clot Master Hula Cup.The purpose of this study was to calculate the platelet capture efficiency during the formation of a fibrin clot by measuring the platelet level in a sample of whole blood pre- and post-clot formation. 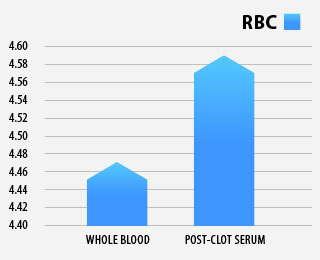 Thirty-five cc of whole blood was obtained via venipuncture from 10 healthy volunteers with no history of clotting abnormalities and no recent use of nonsteroidal anti-inflammatory medication. Five cc of the whole blood was placed in a standard blood collection tube for a complete pre-clot cell count evaluation. The remaining 30 cc of whole blood was immediately placed into the sterile ClotMaster Hula Cup (PS-3111) container with a sintered glass cylinder supported by the lid of Hula Cup. The container was then swirled in a circular fashion for 10 minutes causing a fibrin clot to form around and adhere to the glass cylinder in the ClotMaster Hula Cup. The cylinder and attached fibrin clot was then removed and an additional 5 cc of the plasma remaining in the Hula Cup after fibrin clot removal was then placed into an additional tube for cell count evaluation. 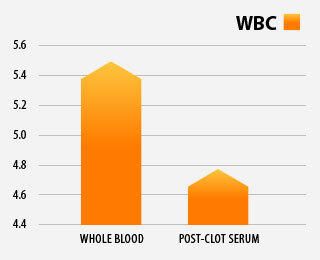 The cell count for pre-clot whole blood and post-clot serum samples were then compared. The Hula Cup platelet capture rate compares favorably to prior studies that demonstrated platelet capture rates of traditional PRP ranging from 17-80%. 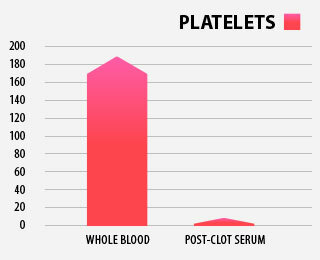 These findings indicate this fibrin clot formation technique creates a platelet rich fibrin scaffold [PRFS]. Recent work has demonstrated that, similar to PRP, clots formed using this device have bioactive components (VEGF, TGF-β1, FGF and PDGF-ββ) capable of enhancing tissue healing. PRFS formed using this technique have potential advantages compared to traditional centrifuged PRP. These clots can be formed quickly, inexpensively and consistently. They provide a fibrin scaffold allowing for cell attachment and migration. Nests of platelets become trapped within the fibrin scaffold and the fibrin binds and concentrates growth factors released by the platelets. These growth factors are then released as the fibrin scaffold breaks down over many days. Finally, the dense nature of PRFS provides a structural integrity allowing for arthroscopic suturing over a repair site. Future studies may demonstrate PRFS formed using this technique to be a superior tissue healing adjuvant compared to traditional PRP.